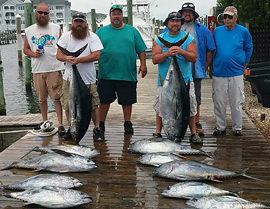 Our Gulf Stream Charters are a 36 mile trip that expand from Hatteras to the Triple O’s. The Carly A vessel can hold up to six anglers with all bait and tackle provided. In addition, the Carly A has all proper fishing licenses, so none are required from you. The Carly A is located at Pirate’s Cove Marina. Find directions to the Marina. We are located on slip. Our normal departure time is usually in the 5:30 a.m. range, but because of conditions or weather, the time may be altered by the Captain. Arrival back at the docks is around 4:00 p.m.